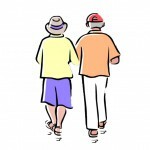 These are every Friday in April, May, Sept and Oct. Local Pensioners can ride the rails for just £2.90 return! Only available to those living in the LA & CA postcode areas. Proof of address will be required at the ticket office. Discounts also available with Windermere Lake Cruises for a bumper value day out! See spring arrive in the Leven valley, and all children receive a free Cream Easter Egg. 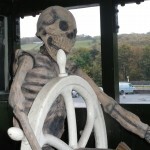 A week of Witches, Wizards, Ghosts and Ghouls at Haverthwaite and the Lakes Aquarium. Can you spot the haunted carriage? Its been trapped forever in Haverthwaite tunnel, lets hope you don’t get stuck there too!!! Onboard creepy crafts in the Halloween carriage. Complete the ‘Ghoul Trail’ and ride to Lakeside for more spooky fun at the Aquarium. Join Father Christmas and his helpers on a magical family journey aboard our ‘Santa Express’. Presents for the children, festive treat and seasonal drink for the adults, with Carols and a good time for all. Take the 1hr 20min return journey between Haverthwaite & Lakeside, absorbing the festive spirit from all the colourful elves to experience a journey you’ll never forget! The excitement builds as you sit in your decorated carriage, the doors close, and on the platform is a procession of elves and of course, Father Christmas, waving to all the children as they pass. As carols play, adults are given a festive treat and seasonal drink. You are teased while you hear a ruckus from a neighboring carriage- he must be on his way! 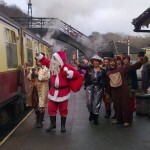 With a boom the carriage door opens and chief elf ‘JoJo’ enters, followed by more elves the ‘panto’ atmosphere is alive, after introductions there is carol singing, getting everyone on-board into the Christmas spirit. In all the excitement, a tall figure in red enters the carriage, watch the children’s faces ‘light-up’, it’s Father Christmas! With the help of his elves he visits every child, delivering a handpicked present. Take this magical journey and create memories you’ll treasure for a lifetime.